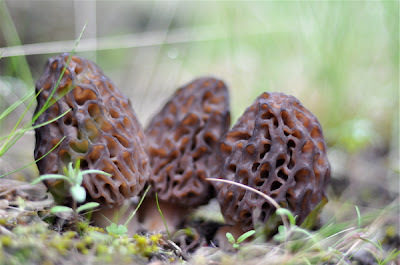 A month doesn't go by on the mushroom trail without some variety of fungi getting picked, packed, and sent to market. 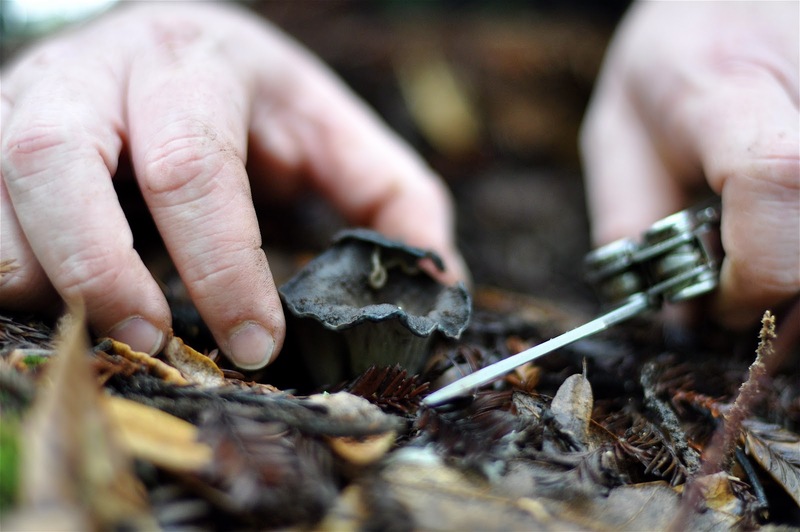 Between Alaska and California, you can harvest wild mushrooms virtually any day of the year. Itinerant circuit pickers, though a far cry from snowbird retirees in white shoes, operate on a similar premise: they move south in the coldest months, calling Northern California's mild climate home for a spell. Their work is known as the winter pick. The trifecta of winter pick includes yellowfoot (Craterellus tubaeformis, pictured at right; like steelhead, the word is singular even when it's plural), hedgehogs (Hydnum repandum and H. umbilicatum), and black trumpets (Craterellus cornucopioides). The latter are simply called blacks by the pickers and they're the backbone of the winter harvest. 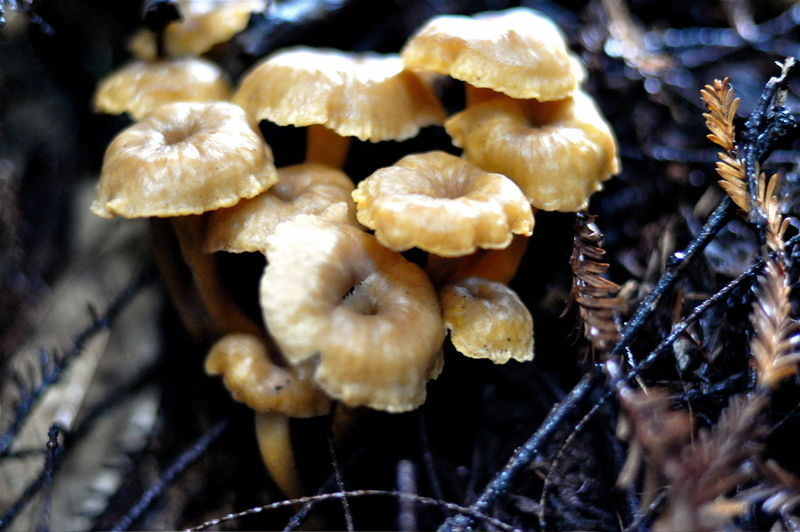 Blacks are members of the chanterelle family and they have that same beguiling mix of fruit and earthiness that make their relative the golden chanterelle so popular in the kitchen. But the blacks, for my money, are even more flavorful. Unfortunately, my home state of Washington is not a hot spot for black trumpets. 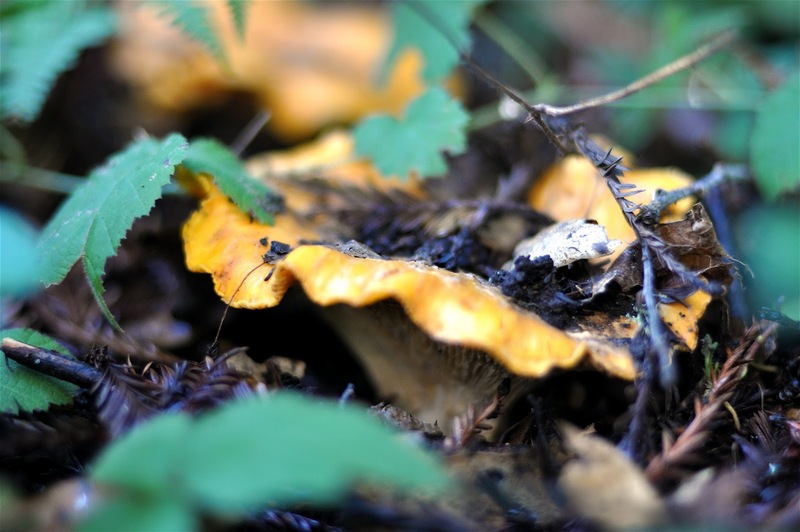 In the western U.S. these mushrooms thrive in coastal hills with a tree composition of mixed hardwoods (especially tanoak and madrone) and a smattering of conifers. Northern California is the bulls-eye. Though not mycorrhizal with redwoods, blacks seem to prefer having a few of them around. Looking for this cryptically colored mushroom in dense tanoak leaf-litter is a challenge. Much of its long, fluted stem grows beneath the duff, making it look like nothing so much as a little hole in the ground. Occasionally, toward the end of the season, large clumps will form, some of them seven or more inches tall and easier to spot. A friend of mine calls these California clusters. This year my timing was off. The season started with promise—and then in January Norcal was hit with a month-long drought, high temperatures, and warm winds that exasperated the situation. The blacks fried where they stood. Gakked was how my picker friends described it, as in "Winter pick is over. The blacks are gakked." You get the picture. Yellowfoot and hedgehogs took a beating as well, though not as thoroughly. But I was headed to the Bay Area anyway, so I investigated a few patches along the way to pick dryers. Doug, the circuit picker of past posts, was with me. He knew he couldn't sell any fresh mushrooms of this quality, so he focused on stinging nettles and watercress instead, with detours to mushroom patches for my dehydrator. After leaving Doug off at a nettle patch where he planned to pick and camp, I continued on to Santa Cruz. The mushrooms down there fruit later than their brethren to the north, so they had largely escaped the killing heat of January. A sharp-eyed member of the Fungus Federation named Nate showed me a few of his patches near town and I was able to load up on fresh blacks to take home. Nate also introduced me to my first mudpuppy—the newly named Cantharellus californicus, the largest chanterelle in the world (see below right). I could get used to an annual pilgrimage south for winter pick. The scenery along the California coast is as spectacular as advertised, and the redwood and hardwood forests are enticingly different from my own stomping grounds. 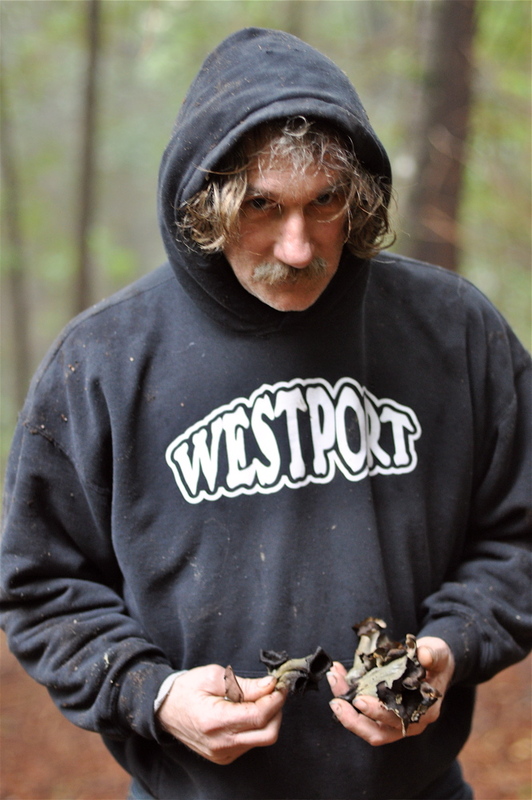 Best of all, a trip to California in winter means a chance to hunt mushrooms while my own patches lay dormant. 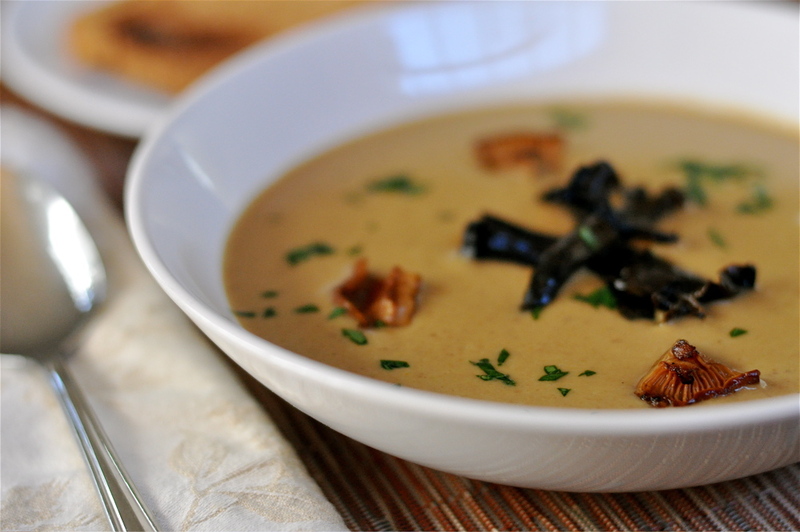 Cooking black trumpets is as easy as throwing a handful in the saute pan with a pat of butter. They go great over a steak, or you can infuse a sauce with their intense flavor. All three of the main winter mushrooms are often used together. One of the best mushroom dishes I ever had was a single spoonful intermezzo of hedgehog and yellowfoot with mascarpone and a single small black trumpet on top. 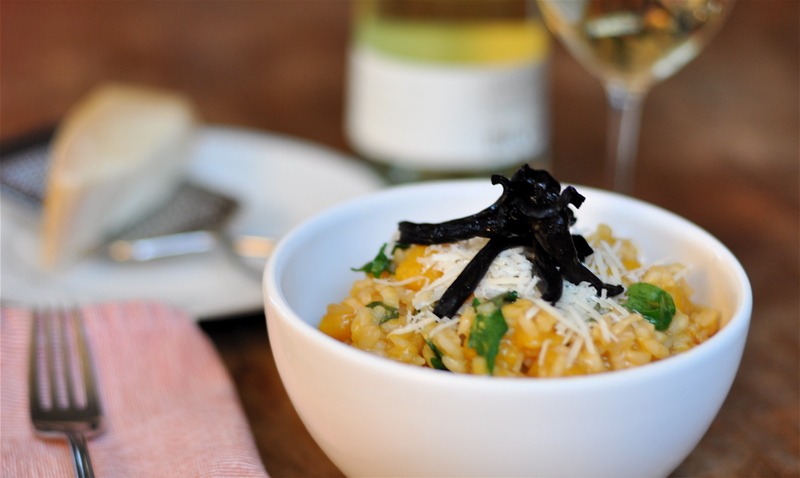 Black trumpets are the perfect garnish for this hearty yet slightly sweet winter risotto, along with fresh cold-weather ingredients such as butternut squash, arugula, and sage. The peppery arugula tempers the sweetness of the squash and the black trumpets add an extra dimension of earthy flavor that you won't find in your typical recipe for Butternut Squash Risotto. 1. 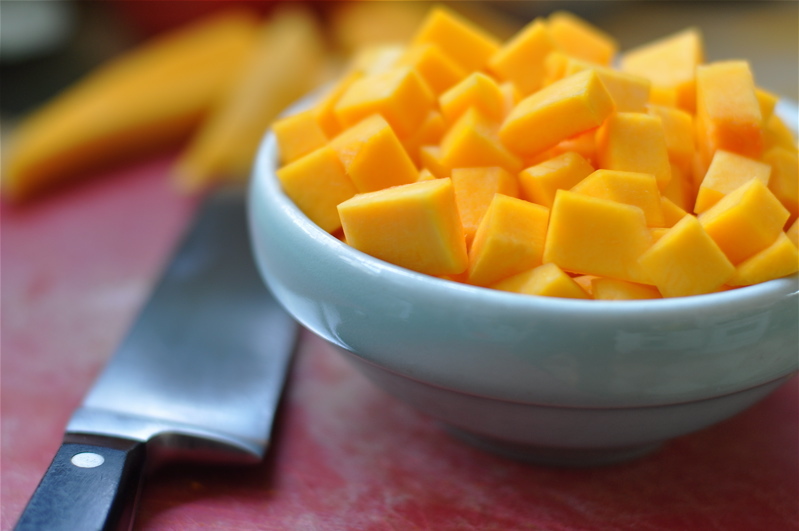 To peel and cut squash without losing a finger, see Simply Recipes. 2. Warm stock in a pot. 3. Saute squash in 2 tablespoons of butter in a heavy-bottomed saucepan, covered, for 5 minutes over medium-high heat. Stir occasionally. Remove lid and cook a few more minutes to lightly brown squash. 4. Add shallot and garlic. Cook together with squash for a few minutes before deglazing pan with wine. Immediately add rice and stir thoroughly to coat. Reduce heat to medium. 5. Stir in a ladle or two of stock, repeating as the liquid is absorbed until rice is al dente. 6. While risotto is cooking, saute mushrooms in a tablespoon of butter. Set aside. 7. 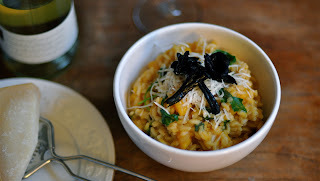 Finish risotto off-heat by stirring in sage, arugula, cheese, and last tablespoon of butter. Season with salt to taste. Garnish with sauteed mushrooms. 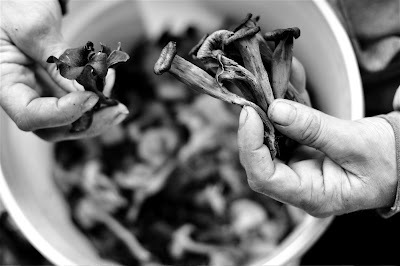 Dear Bay Area Readers: Next week I'll be visiting your neck of the woods to give a couple talks on wild mushroom cookery. I'll be speaking (and showing slides) at the Fungus Federation of Santa Cruz on Wednesday, February 16, and again the following night, Thursday, February 17, at the Bay Area Mycological Society in Berkeley. Come on by and say hello.